You can get yourself a great spotting scope and on a great budget. We have collected a list of the best spotting scopes and classified them according to different activities. The great news is that we have curated great scopes at a really affordable price. The following are the 5 BEST Affordable Budget Spotting Scopes Reviews! If you like to scour the skies in search of birds or looking for a solid choice for targeting shooting & hunting then the Ultima Zoom is what you are looking for. You take home a high-quality refractor spotting scope for a great price. Designed to last a lifetime, this is an incredibly affordable option for the price you pay. It comes in both angled and straight designs. It comes with all the specs that you expect from a more expensive spotting scope. The Celestron 52550 has multi-coated lenses, is waterproof, and at 3.6 pounds, it is rather lightweight. Plan to bring it on your next birding/ hunting adventure. Unbeatble price for the specs you get. It is advertised as 20-60 magnification, but many users coomplain that, after the 20x magnification, the scope delivers not so clear images. This is due to the lack of ED glass. The scope works pretty well, even in low-light conditions. The lens of the inexpensive version is larger than the 80 mm one. However, you get a good visual with a large field of view very appropriate for bird-watching. If you like to scour the skies in search of birds to watch the Ultima Zoom is what you are looking for. You take home a high-quality refractor spotting scope for a great price. Designed to last a lifetime, this is an incredibly cheap option. One remarkable characteristic of the Gosky is that it includes a phone adapter for digiscoping. This is not very common in the lowest-priced scopes, but this one just got lucky to be paired up with this dynamic lens focusing system. Lenses are made with BAK-4 glass. Power gets seriously compromised at maximim power. It does not end there. This budget spotting scope is both waterproof and fog-proof so you can easily take it to the forest and transition to the woods and stay in the field for as long as you need. Despite the low price tag, the Gosky features BAK-4 glass and is fully multicoated. Designed for any spotting scope activity this spotting scope performs in harsh conditions, the Emarth is a great option, equipped with a great varied magnification and a large enough field of view. A unique feature of this spotting scope is the dual focus wheel system, especially designed for long range viewing. This system allows you to lock in your target and zoom in to get more details. When it comes to optics, Emarth really steps up. Multi-coated lenses and a BAK-4 roof prism ensure a clear and bright image with high contrast. This budget spotting scope is waterproof so there is no fear if the weather turns against you. The rubber armor provides both comfort and protection. Definitively a good option when you are looking for a good cheap spotting scope. 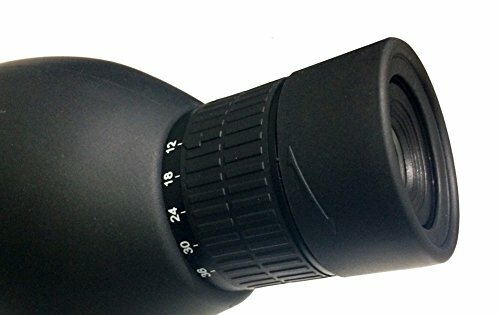 This spotting scope is a great option if you are looking for great value for the price. It contains almost all features normally found in more expensive models. This budget spotting scope is a great option if you are planning on digiscoping, thanks to the clear image, especially at the mid-range magnification levels. These razor-sharp images are provided by fully multi-coated lenses. This rugged one will then deliver the best digiscoping experience. You get HD photos and videos of your favorite bird with a set-up made for the most demanding. To make things even better, it comes at an affordable price! A 20-60 x 60mm magnification in a pretty rugged piece gives you the confidence you need. This scope is highly durable and designed to last a lifetime. When it comes to hunting, you need a spotting scope that is at the top of the line and made with prime quality. The Roxant Authentic Blackbird is a budget spotting scope that is serious about delivering exactly that. It is light and portable, making it easy to carry. The power is just appropriate for hunting large animals and the built is appropriate for outdoors. The scope is water resistant and is covered with a protective anti-slippery rubber armor, making it highly durable. Multi-coated optics and a superior BaK-4 prism guarantee the clearest image for spotting scopes of its kind. The Roof Prism Optivs Makes Them More Difficult To Focus. We found our favorite spotting scope under $300 and it comes with a case and a tripod. This spotting scope is ideal for pretty much any kind of adventure. Take it to your hunt, to your birding, to take photographs, and have the best viewing experience of your life with the Konus spotting scope. You get a magnification of 20x to 60x built into a spotting scope that has an objective diameter of 80 mm and has the name Konus on its side and you get a pretty successful product. Despite the objective lens of 80mm, the Konus 7120 Spotting Scope actually only weighs 3.4 pounds which makes it pretty comfortable for outdoor trips. Forward expanding lens hood protects from the glare from day watching. The carrying bag is not great. We recommend investing into a better one. We like how strong the build feels on your hand. The site is really nice and colorful, just like it is supposed to be. The field of view is also pretty good at 157.2 feet at 1000 yards for the 20x magnification. We do not really find anything bad about the Konus 7120. It does lose some clarity when it comes close to 50x, especially when it is cloudy but this is the occurrence in most spotting scopes. Regardless of your type of adventure, we are sure you will find this spotting scope of great value. You probably do not need a scope to only birding. If you are planning to use your scope for other activities, you must realize that this means that your budget should go up as well. But there is no need to fret, we got you covered. Celestron is always on the frontline of providing high-quality products at a great price and the TrailSeeker is one spotting scope you must lay your eye on. The Celestron 52332 80-45 degree spotting scope offers durability, performance, and great optics. This gadget is equipped with some great features that make it more versatile. It is coated with a strong armor that gives it durability and it is also waterproof and fog-proof. Magnification can vary even more thanks to removable eyepieces. The image that you get thanks to the BaK-4 prism, propriety XLT, and fully multi-coated lenses, is crisp and sharp. You get vivid colors as this scope performs very close to those billed more expensive. It has an angled eyepiece and a really nice compact design as it is kept at a minimum for an 80-mm diameter objective lens. The eyecup is twist-up to allow a better focus and the eye relief is 18-15 mm. The rotating tripod setup of this spotting scope allows rotation of the scope in all directions. It also comes with a T-mount adapter to connect DSLR cameras to the scope. This one also features a dual-speed focusing (fine and coarse) to better get a focused image. This one does not include a tripod either, which would have been nice. Other than that, we believe that Celestron’s TrailSeeker is a great option for birders.